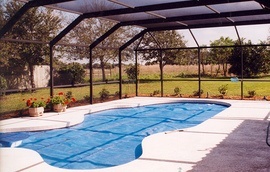 Protective outdoor pool cover used to trap the sun's heat, thereby helping to keep pool water warm. Swimming pools that are located outdoors absorb up to 85% of the sun's energy in direct sunlight. In the shade, pool water quickly loses this warmth. A solar pool blanket helps to conserve this heat. Within approximately one week, this type of pool cover can raise the water temperature by up to 20 °F, saving on your pool heating costs. A solar blanket averages $150 to $225. Automatic types may be 2 to 3 times more. Manual versions are the least expensive option.